The fish come up from deeper water to feed and spawn in “waves” or “swarms,” according to guide William Attaway. “It sounds crazy, but the fish will come through in a swarm. Then it might be another half hour or 45 minutes before another swarm comes through,” he said. Sometimes, he said, no more waves or swarms of fish will come through for a long time. This makes for inconsistent fishing and increases the necessity for catching as much out of a wave as possible when one does come through. Once he picks a spot, Attaway double-anchors his boat, then puts out a dozen rods with cut bait. “I want to catch all I can when they do come through,” he said. 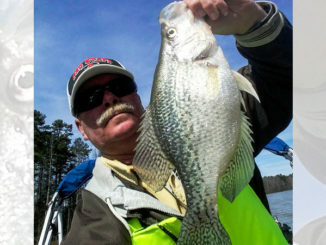 Attaway uses cut bream, perch and gizzard shad and has even used pieces of carp and caught the catfish on them. “I like to fish for big fish, too, so sometimes I will put on a piece of bait three fingers wide. 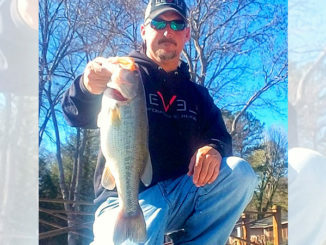 I’ll use 1-inch by 3-inch strips of bream or perch, either steaks or fillets,” said Attaway, who scatters a dozen baits on Carolina rigs out so that some are in the shallowest areas and some in the deepest. 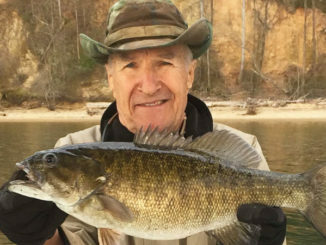 “You have to see what is going on with the fish and move more rods in the direction where you are catching the most fish,” he said. Prime fishing spots are over the mussel beds in Lake Monticello, Attaway said, because the freshwater mussels are like catnip to the catfish. 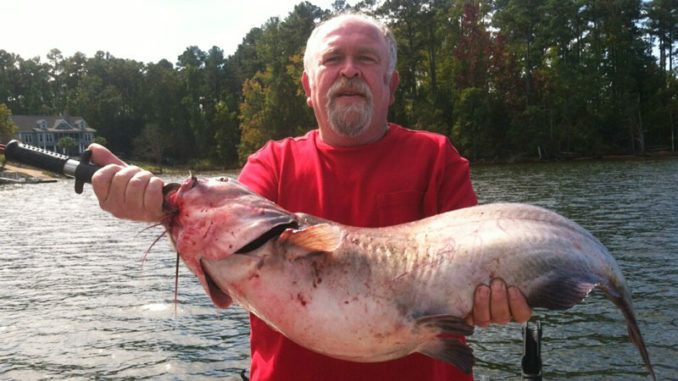 A typical spring trip to Monticello, he said, will produce two or three blue catfish in the 30-pound or larger range, with the possibility of hooking one of the monster blues that roam the depths of the lake, plus a bunch of catfish in the 10- to 12-pound range and a lot of smaller ones.